Dauphin Lake, 200 mi northwest of Winnipeg, Manitoba, Canada. Friday, May 10th, dinner-time. Winds up to 35 mph pushed ice floes from the lake onto the shore of the Ochre Beach neighborhood and into the houses, completely destroying 6 and damaging another 14. “Bang! 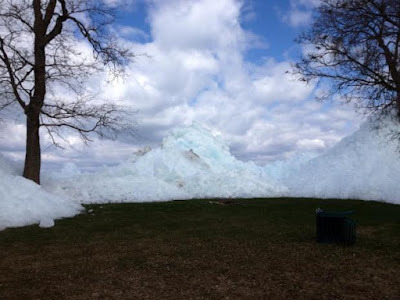 The ice came right through the living room,” says homeowner Dana Billows of the event which lasted a mere 15 minutes (PHOTOS AND VIDEOS HERE).